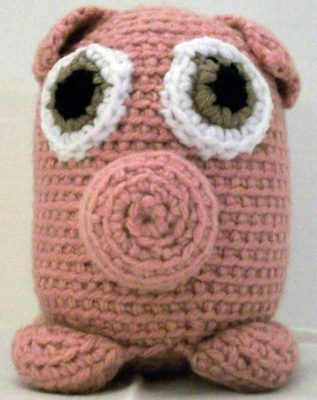 This little piggy has Bette Davis eyes and a curlicue tail. It measures approximately 5” (13 cm) tall. Medium weight yarn in 4 colors – approximately 60 yds (55 m) in pink (CA) and small amounts in white (CB), black (CC), and brown (CD).